They are sought after all over the world for their expressive vocals and intricate arrangements of classic gospel hymns. Send me a text reminder! After being featured on Vashawn Mitchell’s “Chasing After You”, off the GRAMMY® nominated Triumphant, Trey McLaughlin & The Sounds of Zamar have become sought after all over the world for their expressive vocals and intricate arrangements of classic gospel hymns. 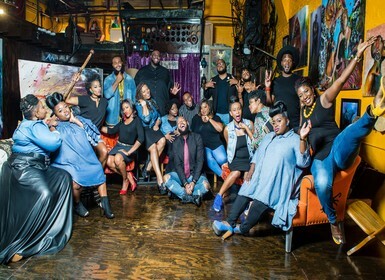 The group has made a name for themselves by performing with gospel greats, such as William McDowell, Kierra “Kiki” Sheard, Richard Smallwood, Earnest Pugh, and James Fortune. Trey McLaughlin & The Sounds of Zamar have transcended cultural boundaries with their fresh adaptations of contemporary gospel, pop and musical theatre hits - the group’s music is sung all over the world. Thanks to their viral videos and millions of loyal YouTube followers, Trey McLaughlin & The Sounds of Zamar have toured extensively abroad and are positioned to be one of the brightest new groups on the gospel scene. In fall 2012, the group released its debut album, Limitless, which featured 14 tracks of ballads and anthems that simultaneously showcased rich harmonies and the awesomeness of the Lord. A second album is anticipated for 2018. © Troy Savings Bank Music Hall 2019. All rights reserved.